HELLO and welcome to the Altenew February release blog hop. If you have come from Create & Craft TV Blog you are right on track. For today's hop I decided to use the Happy Bloom set and the Birds of a feather set. I used the first for my layout and created a simple card with the sweet birds. I stamped the images with some permanent black ink which I left to dry overnight, just to make sure it wouldn't bleed when I coloured it. I used Altenew markers to colour the images. For dimension I popped the flowers onto foam dots. For a bit of sparkle and flow I adhered some sequins to the page and also added some butterflies for movement. Those of you who have been following me for a while know how much I love butterflies. I also added a little cluster in the bottom right hand corner for balance. For my card I kept it really simple. 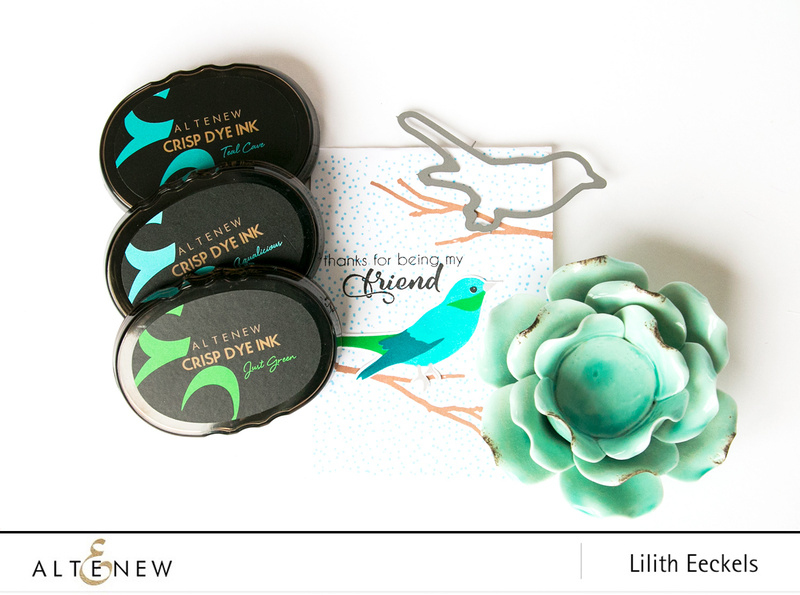 I stamped the bird with some of the new inks from the Green Meadows and Sweet Dreams set. I used a blue marker to add dots to the background for some interest. I will each draw a winner to receive a $30 gift certificate. All you have to do is leave a comment by Febraury 13th. What has caught your eye? I'll announce the winner here on my blog on the 14th. Next stop is Dana Gong. Absolutely love your color combinations!! What a beautiful collection of cards!! oops I commented on the wrong day... lol. I love your card and your layout. Beautiful layout with those gorgeous flowers well colored and placed on your page! Sweet cards. Love the new release. The layout on your scrapbook page is just lovely. You are going to enjoy looking back at it in the years to come. I like the bright colours on the bird. Such a pretty card. The florals are so bright and cheery. And I like the simplistic style of the bird card. Thanks for sharing. Beautiful colors on the bird. I like the new greens especially. 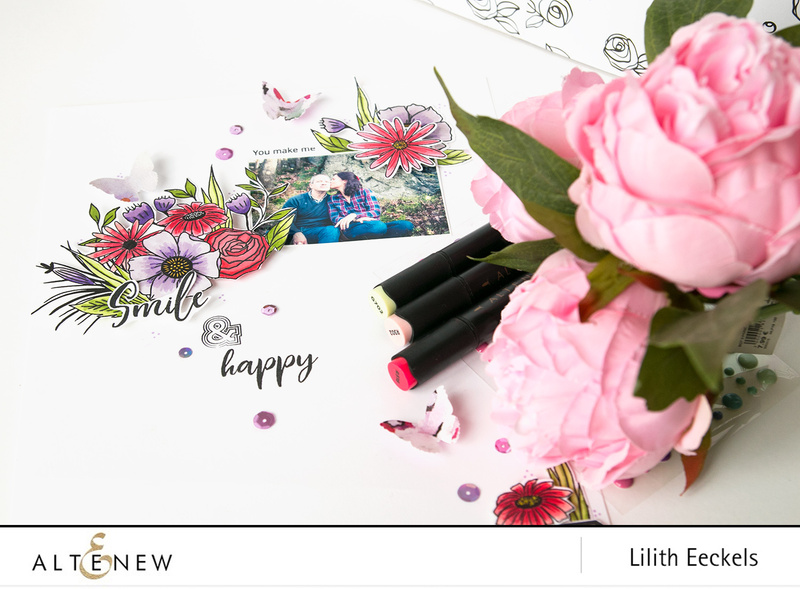 such a lovely, colorful layout with these new floral stamps, Lilith! Beautiful projects and a great use of the new colors. A great release. Such a sweet layout!! I love that photo and the flowers mix so well with it. Your card is fantastic too! I love those birds! What a great layout. I love the flowers and the use of white space. Very impactful. Your page is so delicate and pretty. I LOVE to see stamps on layouts. The colorful flowers first caught my eye. Just stunning. Great colors and designs and a great new release. Thanks for the inspiration!!! love your coloring on the cards, they are beautiful. Gorgeous projects! Your scrapbook page is stunning! Love the colors and your card is very pretty too! Awesome release! This is a beautiful layout and I love how how you used the flowers! A beautiful layout and gorgeous bird card. delightful layout! I love how the red in the flowers also takes your eyes to the photo and the red in your shirt. And your CAS bird card is fab! Gorgeous layout!! Love the way you used the florals. Beautiful scrapbook layout. Just color the coloring. Beautiful work! love the flowers!! Lovely layout. The entire release is wonderful. 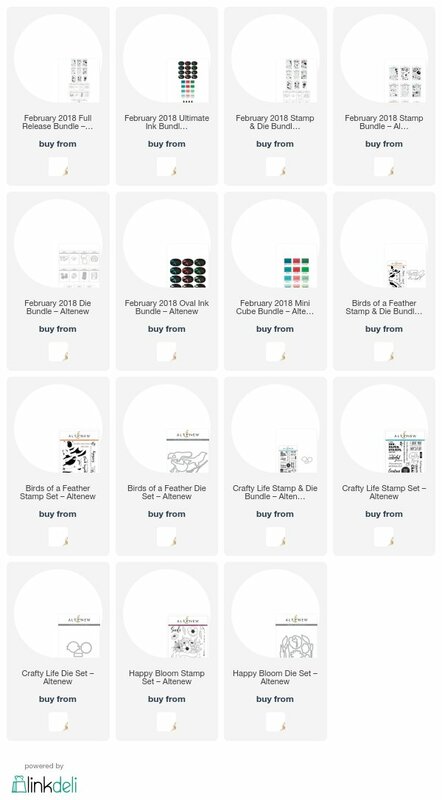 My particular favorites are the Crafty Life and Trigonometry stamp sets. Beautiful layout and card! I love the new Crisp inks. Such a pretty layout and for the card... I’m loving the new greens!!!! I love the simple bird card. I will have to try to make something similar to this when I get my stamps set. I hope you email the in er if they have won. It is so hard to remember to go back too all the hops. There are 31 this time. Love the beautiful layout and the simplicity and elegance of the card. Oh my goodness. Your coloring. I bow down to you! Love the floral layout and the sweet bird card. Thanks for sharing your creativity and inspiration! Beautiful layout and such a sweet card. Very pretty projects! 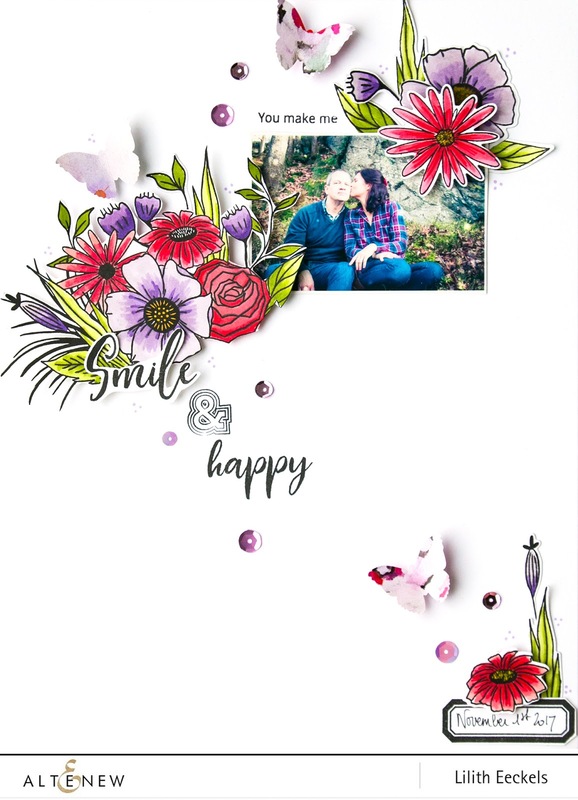 I'm not a scrapbooker, but your Happy Blooms layout is so lovely that I'll have to figure out how to do something similar on a card. Love these bird stamps and the new ink colours!! Beautiful layout - the flowers are gorgeous. Love the white space on your scrap layout! I generally layer all kinds of colorful scrap papers so this is a high compliment! 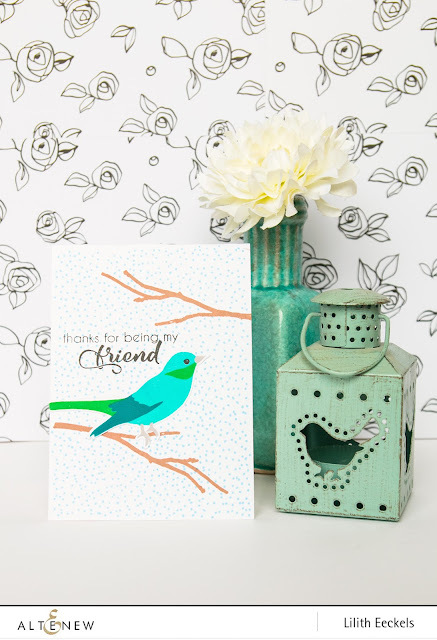 Gorgeous flowers on your pretty layout and the bird card is super sweet too! Wonderful colors and I am going to have to start stamping on my LO's. Thank you! That is a cool bird card. That die and stamp set is great. I love your layout - wonderful use of the flowers. Great layout and an awesome card !! Love seeing your layouts! Always so inspiring! Your layout really works so well with the popped up beautiful coloured florals, I'm also a huge butterfly fan and I love showing their beauty off if they fit in too. Its always so nice to see how stamps can work with scrapbooking. Thanks for the i spiration. I do love the birds. Nice layout and card. The new ink colors are so pretty. These flowers are beautiful and the birds are so sweet! 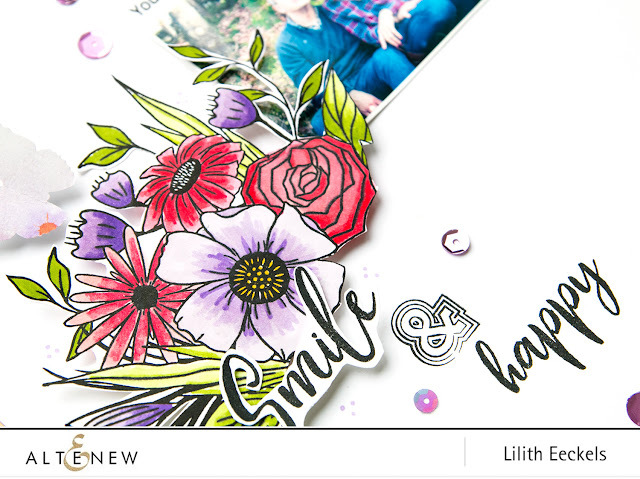 I absolutely ADORE the scrapbook layout you created with the stamps and coordinating dies. Lovely! What an amazing layout! So pretty. Thanks for sharing. Your layout is absolutely gorgeous! I love the bird stamps you used for your card, as well! I like the addition of the butterflies on the layout with the flowers and the bird card is sweet. Two beautiful creations! I love how the bright flowers against the white background really draw your eye right to the photo. Absolute gorgeous layout. Card is pretty too. Love the birds! 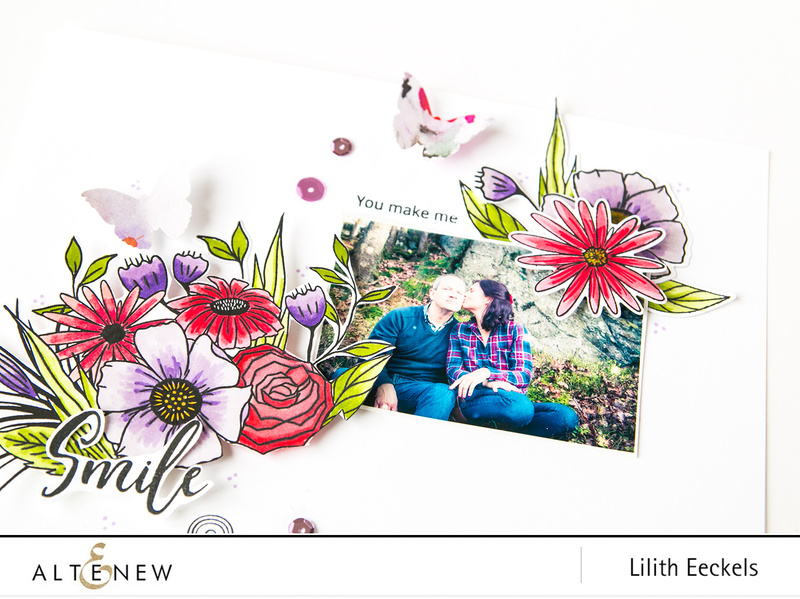 Love your beautiful card and your page layout is gorgeous. Lovely layout and card Lilith. Thank you for sharing. Love your layout and cards. The new ink colours are superb! Such beautiful cards :) Love this release from Altenew. My favorite is the ornamental stamp set. OH wow, beautiful, I love those white space! I love your bird card, very sweet and a very versatile stamp set to have. Such a beautiful layout! The flwoers are just perfect! I love the movement and the very effective use of white space in this. Tucking the photo into the floral cluster is wonderful, and the butterflies add the perfect little surprise element! Thank you. beautiful. Love how you did the date in the bottom corner. And I'm a birdie lover, so that's always a winner for me. 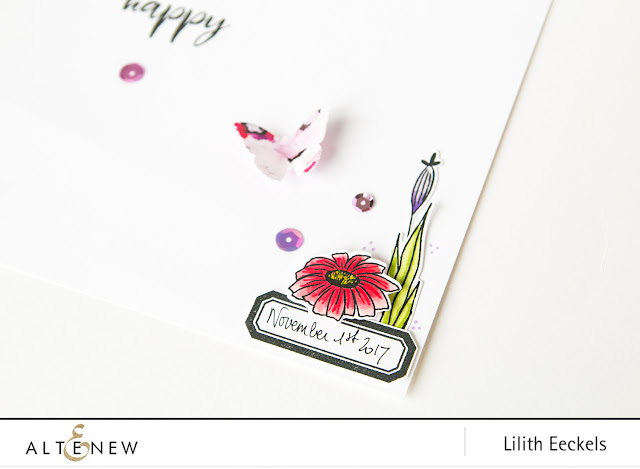 Your card AND layout are both lovely Lilith. Well done. Love your layout - oh so pretty! Thanks for sharing! The Happy Bloom card is sooo purdy! Lol. Very pretty. Love this card,this set,this release! Lovely projects! Red and purple are one of my favorite color combos. Thanks! Both projects are wonderful! Love the new ink colors! Great job coloring your floral image. I really like how you used it on your layout. Thanks for sharing with us. These cluster of flowers spread around the page look wonderful. Lovely page. Your bird card is simply gorgeous, but my favorit is your awesome lay out, just beautiful. Thanks for your time and effort to make and show this to us. I love the scrapbook page, the floral is so pretty. I love the vibrant colors for your layout flowers and the bird on your lovely card. Gorgeous projects! this is a great release and your page looks great. thanks as always for sharing. Beautiful layout page and card! Absolutely fantastic!! Love your design on the scrapbook page. Love the layout! The Happy Bloom set is so beautiful and versatile! Beautiful card and layout! The bird stamps, the cross stitch flower stamp and die set, as well as the new inks have really caught my eye! In love with that layout! Love how the flowers and picture absolutely pop against the white! Beautiful layout and card! I love the colors you used with the bird! I love the colourful florals on white background and your photo is so sweet! Love that gorgeous bird too! Beautiful layout! Thank You for the inspiration. A beautiful layout and card! I love the way you have used the beautiful new stamps! Thanks so much for sharing! I just cannot get over the birds and how beautiful they are. Cute projects! 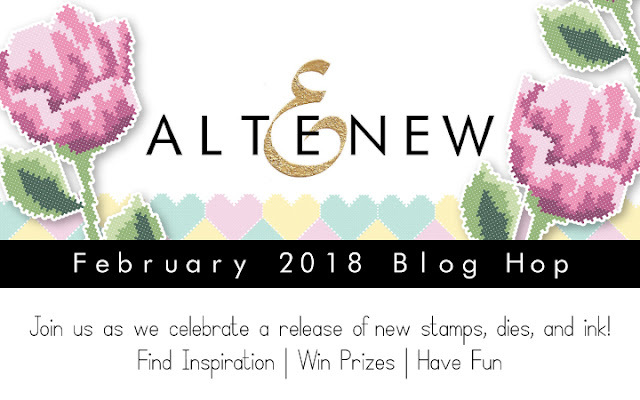 The new stamp set that captured my heart is the Crafty Life stamp set. Every crafter should own one! Your page is so beautiful - full of color and happiness, This stamp set is perfect for scrap book layouts or card making. It is just so versatile and easy to use. I can imagine many, many ways to use this set. I love your bright, bold colors. Also love the Birds of a Feather stamp set. Thanks for sharing! I love your coloring! They turned out really beautiful. Oh, I love all that white space on your scrapbook layout. It really allows the eye to be led by the flowers. And conversely, I think it was a really good idea to put the dots on the background of your card, because it just adds such a nice texture behind the bold bird. Thanks for sharing some lovely ideas with us! Beautiful projects! The red and purple color combination is just stunning! Your layout made me smile. I love the detail of the little flowers around the date. Just an overall beautiful design. And your bird card was cute too. Sewn With Love is still my favourite but Happy Blooms and Ornamental Blossom is right behind in close seconds along with A Crafty Life. Those birds are also gaining more ground the more I go through the hop - LOL! It is so great to see all the ideas and the Altenew Inks are absolutely beautiful. Thank you so much for sharing your beautiful layout and giving such a great idea to use as a backdrop with simple dots as you did for your Bird card. Your layout is so crisp and refreshing looking! The vibrant colors against the white background is breathtaking! TFS! I love your projects! The colours on your layout match the photo so well! Gorgeous layout and card. I am loving this Happy Blooms set - so pretty and so versatile ! Love this! Great ways to use the bird stamps! Both projects are lovely! You've created some wonderful images with color! The scrapbook page makes my heart happy! That's the scrapbooker in me - there's so much meaning in a page filled with love!!! Thanks so much for sharing and inspiring! Great layout and card, live them! Beautiful projects! Love the layout and the grouping of the flowers! Wow! Your projects are so beautiful! Your page is so beautiful. Love everything about it! Gorgeous layout! So bright and colorful. Love the card, too, so pretty and elegant. Thank you for the sharing of your creative side. The colors you chose for the flowers is lovely. Your card turned out beautiful! Love the new inks, can't wait to try them out. Stunning layout and gorgeous card! Thanks for the inspiration! Adding butterflies to the flowers on your scrapbook layout was such a sweet touch. And the bird...he’s so stinking cute! Like you, I love butterflies. It makes me sad to hear they are becoming extinct. I plant Lantan's in my yard and it's the Butterly flower but only a few tiny butterflies are attracted to it. Your tiny butterflies remind me of the ones that come in my yard only mine are a little smaller. I have a lot of butterfly stamps and I don't have a die cutter but I might have a punch. Your little butterflies are sp precious and they looks like they could just fly away! You added just the right amount of sequins. I love your colorful bird! The coloring is very pretty on the bird and the tree branches. I love those new stamp colors! I might have to pick some up! Thank you for showing us your pretty things and for giving us the chance to win something.